Hi guys! This is our first post on our blog and we hope you will comment on what you thought. We had a great barbecue on last Friday the 15th of May. It was our first in what we hope is a very long series of barbecues.We will be holding another hopefully amazing barbecue in the retail park Letterkenny on this coming Friday the 22nd of May and hope you will all attend. Our fantastic chef Damien has prepared some amazing foods for you all. On offer this Friday there will be marinated chicken, chicken & lamb kebabs, 8oz prime Irish steak burgers from the friendly butchers and McWhinneys famous foot long sausages on a fresh maize sub roll. To complement our barbecue our chef has also prepared a choice of three delicious salads a Potato salad, Cajun rice salad and a Chilli penne pasta salad. Our regular full menu will also be available. I don’t know about you guys but I got hungry just writing that. Don’t worry about the weather, we will be outside barbecuing rain or shine. 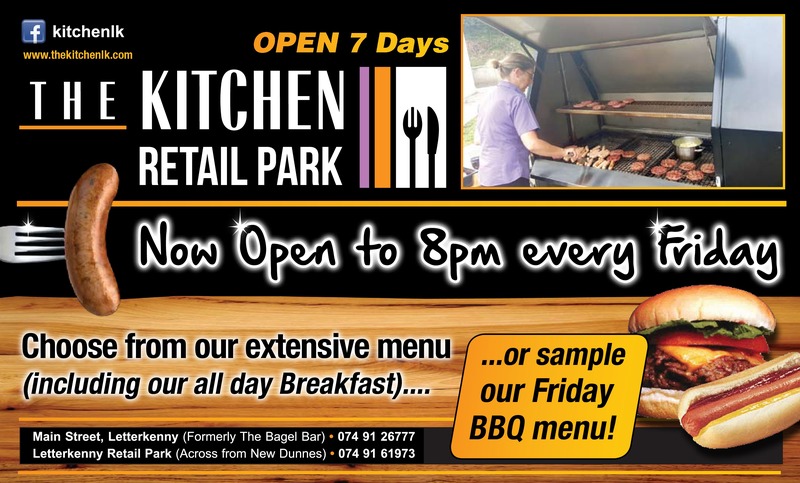 The barbecue will be held at the kitchen in the retail park and everyone will be able to take a relaxing seat inside. We are hoping to hold a barbecue every Friday evening from 5pm to 9pm for the rest of the summer and we are really looking forward to seeing all of you there. We don’t currently have a wine licence but you are more than welcome to bring your own bottle. No Replies to "Friday Night"